Have you heard of The Forest? 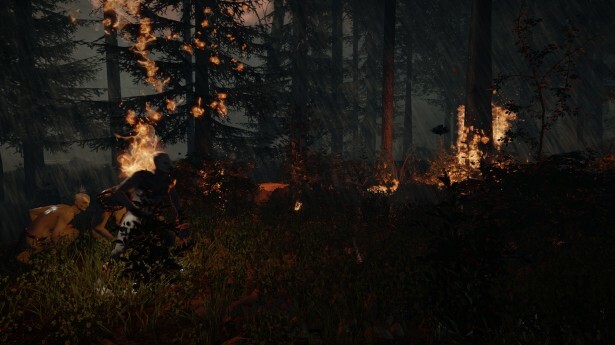 The Forest is an open-world survival game being developed by Endnight Games that will be going into early-access on May 22. It is a game that struck me as both beautiful and disturbing, and each time Endnight releases a new trailer for it, I find myself getting more and more excited. On March 19, Endnight released the third trailer for The Forest, detailing more of the late game shenanigans. Here’s our third trailer, showing a more extended look at some of our survival systems and also what life is like in the forest a little further into the game. The first thing I noticed when I saw The Forest was that the game looks undeniably gorgeous. It is possibly the most technically beautiful indie game I’ve seen considering the lighting effects and particles, and It’s shocking that they’ve managed subtle things like reflective water on bodies and seemingly dynamic wildlife. There are serene qualities to the graphics that boost the atmosphere and make the game feel oddly welcoming. That is, until they take any sense of safety away and throw hordes of hideous creatures your way. That stark contrast plays well into the games atmosphere and makes the encounters even more startling. The balance between reprieve and horror seems to be an idea they’re keeping in the forefront, as each trailer shows off tranquil scenarios which slowly lead into the things nightmares are made of. Furthermore, if you consider that the AI is programmed in such a way that the cannibals might watch from a distance or stalk you rather than engaging in all out combat, it seems that there will be many terrifying and exciting moments that make The Forest memorable. Beyond this, the gameplay seems to revolve around survival and crafting. Everything from cutting down trees and building structures, to hunting, fishing, trap-making, and weapon crafting. All of these elements combined really make it feel as if you will be fighting for survival. How deep they make the system is something we will have to keep an eye on, but if it’s anything like what the trailers are hinting at, every single choice and action could be life or death. The more Endnight teases The Forest, the more I want to sink my teeth in. If the trailer above left you wanting more, head over to these links for more survival horror goodness.